We are excited to know you are thinking about marriage. Marriage is one of the covenants of faith. It is modeled throughout the Bible as God’s design for sacrificial love, fulfilling intimacy, and covenant relationship. Congratulations! You may have just become engaged and are now considering where and when you would like to get married. 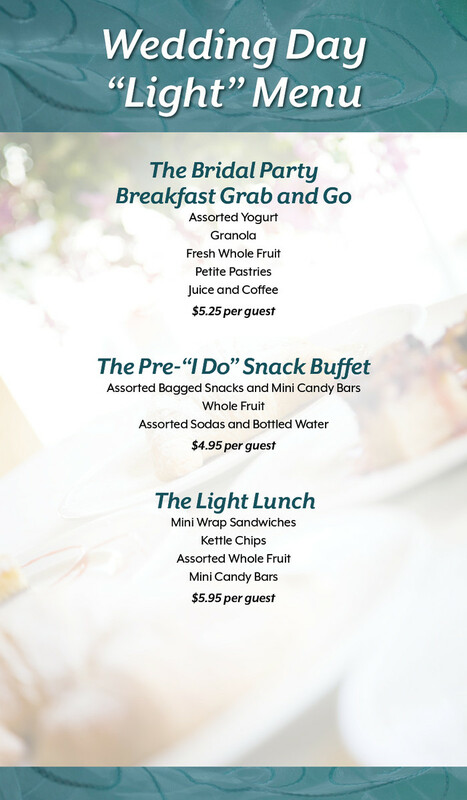 We want to help make the planning process for your special day smooth and streamlined and to assist you in preparing for your life covenant together. Complete an online wedding application. Once we receive your request, we will speak with you directly to put a soft hold on your request. This will only temporarily hold the date for about 21 days while you complete the rest of the steps. Contact the Marriage Administrator at or 952-224-3051.
Who would you like to officiate your wedding and, more importantly, counsel you in preparation for your marriage? To be married at Grace Church, we require that one of our pastors be directly involved in the ceremony and pre-marriage counseling. Selecting a pastor may be as simple as calling your desired pastor and confirming their availability for the ceremony date and counseling (three two-hour sessions minimum). You may wish to meet with and interview some of our officiating pastors before making your decision. If so, we recommend that you do so as soon as possible by contacting the pastor directly or through his administrative assistant. Once you have confirmed date availability and made the commitment to counseling, you will need to complete the PREPARE marriage preparation evaluation tool to help us assist you in the pre-marriage counseling. PREPARE is a widely used tool to assist Christian couples to better understand themselves and the areas they have to work on in preparation for a lifelong covenant relationship. Once confirmed, the pastor will be sending you a link to the PREPARE evaluation. Schedule your first counseling meeting with officiating pastor. Once you have confirmed the pastor who will counsel you and officiate your wedding, you will need to secure your reservation of the date, time, and location of your wedding. This will occur following a meeting you will have with the officiating pastor, who will confirm the plans for your wedding with the Marriage Administrator. Send a $300 deposit for your wedding to the Wedding Administrator. You can also bring the check to the first meeting with your officiating pastor if you have not already sent it to the Marriage Administrator. You will be assigned to one of our Wedding Coordinators with whom you will plan locations, photos, decorations, flowers, music, ceremony, reception, etc., and make the dreams you've always had for your wedding day a reality. Review the Wedding Ceremony Packages pricing. The dream of your wedding day is now in motion, filled with excitement, anticipation, and expectations. Our Hospitality Coordinator is ready to help make your day special by creating a memorable wedding reception for you and your guest. 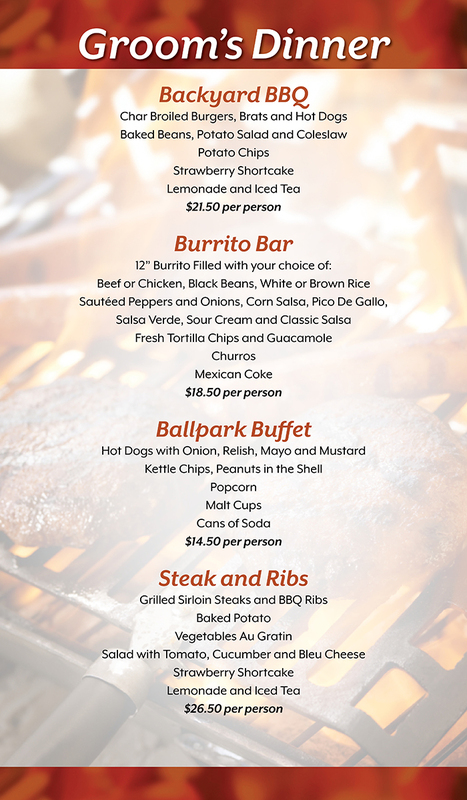 Our Professional Culinary Staff has carefully prepared savory menu items that are sure to suit your tastes, needs, and budget. All this is to make your wedding day dream come true. 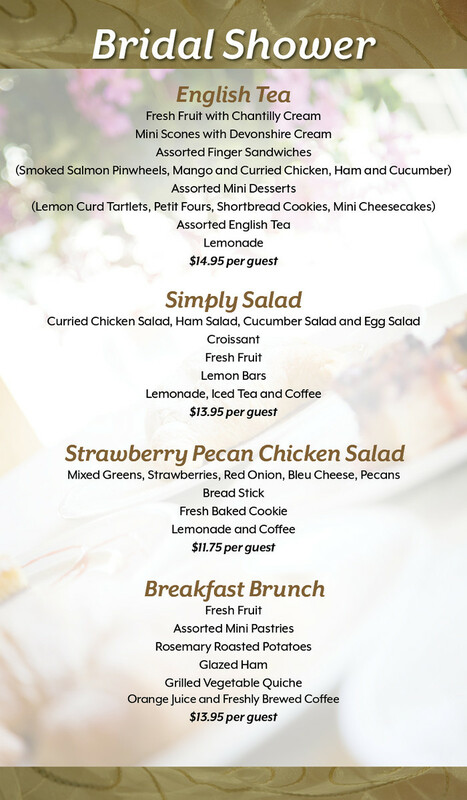 View our menu selections and photos of food and events here at Grace listed below.